Cats are lovable, awesome creatures that deserve to be pampered. And what better way to show your kitty you love him than to offer him delicious treats from time to time? Cat treats are a tasty way to encourage good behavior, help your feline friend clean her teeth, or just reward her for being the greatest pet. But as with anything, moderation is key here as well– many treats are packed with useless calories that only promote unhealthy weight gain, so it’s crucial to ration them judiciously. In general, no more than 10% of your cat’s daily total caloric intake should come from treats, so choose how often to give them wisely. To help you pick the best cat treat for your feline companion, we’ve scoured hundreds of reviews and tested dozens of treats, finally coming up with a list of top 10 best cat treats. Read on to find the right one for your pet. 100% nutritionally complete and out-of-this-world tasty in cat-terms, the Temptations Mixup contains a variety of fish flavors: tuna, salmon and shrimp in every bag. This fish-flavor inspired treat is crunchy on the outside and soft on the inside, so it’s sure to make your cat excited (more like crazy) for more. 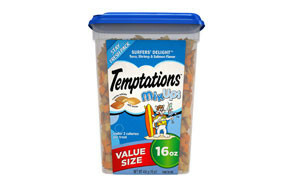 The Temptations Mixup treat is not only delicious, but relatively low in calories, so have no fear offering this treat to your cat if he's slightly on the heavy side, as the balanced nutritional content can actually help him control his weight (of course, you always want to offer treats occasionally only). Also, this cat treat has tartar-controlling properties which is great news for your kitty’s dental health. If you’re looking for a dental treat for your cat, this is one of the best ones you could find. Tasty, with oven roasted chicken flavor, this treat fights tartar buildup and cleans teeth like nobody’s business. Made from natural ingredients and fortified with vitamins and minerals, Feline Greenies are a perfect choice for health-conscious pet parents. This treat is vet-recommended and proven to prevent tartar and dental disease, so, if you notice your kitty is starting to show some oral health issues (bad breath, gingivitis, etc), offer her this dental treat every day – she’ll thank you for it. A fair warning – once she tastes it, it’s unlikely she’ll leave you alone until she gets her next treat! You’re not the only one who likes a good party mix – you can bet your cat loves it too. The Purina Friskies are one of the most fun and delicious treats you could get for your cat. Crunchy, with chicken, liver and turkey flavors, these treats will leave your cat meowing for more. Surprisingly (considering how addictive these are), the Purina Friskies Original Crunch treats are low in calories – less than 1.5 calories per one treat. This means they can come in handy if you often need to do something your cat doesn’t particularly enjoy, like brushing or claw clipping - offer this tasty treat as a reward or an incentive and your feline friend is sure to cooperate. Made with real chicken meat (no artificial flavors here! 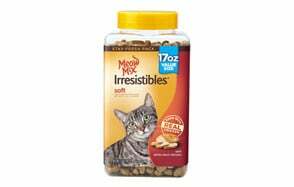 ), the Meow Mix Irresistible treats have a soft texture and delicious taste that your cat will absolutely love. And she won’t be the only one – with a resealable canister, you won’t have trouble storing these treats, nor keeping them fresh and tender. With ingredients that are sourced from the U.S. or occasionally Canada, these cat treats are not only of high quality, but are low in calories. So, if your kitty is starting to put on some serious weight, these 2 calories per one treat goodies are a great option to show him some love but still keep his weight under control. If you want to treat your cat with real, healthy food that is also moist, tender and crazy-delicious, try the Blue Wilderness soft cat treats. With no grain, artificial flavors or preservatives, but with real chicken and turkey meat, this cat treat is loaded with all the right nutrients but does not lack in texture or flavor. As the manufacturer states, Blue Wilderness is inspired by the diet of wild cats, specifically lynx, so you can rest assured your cat is getting what it needs in order to grow and be healthy with these treats. Nevertheless, as with any other treat, moderation, moderation. If your kitty cannot eat grain at all, but you do want him to eat a variety of foods, including treats, the Wellness Kittles Crunchy treats are a good option. With a combination of high-quality salmon and cranberries, these cat treats are rich in healthy omega 3 fatty acids, which are great for your feline’s pet overall health, including the look of her coat. Crunchy, super-yummy, healthy and low in calories, these treats are guaranteed to make your kitty purr with satisfaction. Encourage good behavior or just spoil your feline pet with the Wellness Kittles Crunchy treats – it’s your choice (though we do advise the former!). If your cat needs help cleaning his teeth, offer him the Purina DentaLife treats – they’re not only great at their primary job - teeth cleaning and oral health support - but are very tasty and your cat will absolutely enjoy their crunchy, porous texture. Enriched with calcium and taurine, with chicken flavor and a texture specifically designed to clean all sides of the tooth, the Purina dental treats will keep your cat’s gums and teeth healthy for as long as he eats them. As a bonus, you’ll have fun watching him eat these – crunching down on one side of his mouth, then the other, the cat is sure to enjoy his teeth cleaning. A treat that’s also great for cat health? The Pet Greens’ Cat Craves treats contain real high-quality salmon in combination with healthy greens for the pet’s digestion. With no artificial colors or flavors, but with healthy omega 3 fatty acids and wheat grass, these treats are not even a cat’s guilty pleasure – they’re just a pure pleasure. The Pet Green Cat Craves treats contain no wheat gluten, soy or corn, so they’re safe even for cats with sensitive stomachs. 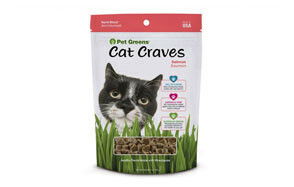 So, if your kitty is an apartment-kitty only, these treats are a great alternative to outdoor grasses and houseplants, as they provide an all natural, nutrient-rich treat. If you and your cat are all about high-quality food, then all the food your pet eats, including the treats, need to be as healthy as possible. Lucky for you, one brand, the Vital Essentials, are on the same page – these cat treats are rich in protein, healthy omega 3 fatty acids, and contain no artificial... well, anything. If you have a senior cat that prefers liquid foods now, or just a kitty that loves its treats extra creamy, the Hartz Delectables Bisque lickable treat is the ideal treat for you and your feline companion. A smooth blend of tuna and chicken makes this treat a true joy for all cats. Most tabbies love this treat so much it’s hard to believe it’s healthy! But it is – in fact, it’s fortified with important vitamins and prebiotics that support overall health and kidney function. To shower your cat with love and encourage good behavior, pour the treat into your cat’s dish and watch it eat it with pleasure. Every pet parent wants the best for their pet children, treats included. But with hundreds of cat treats on the market, picking the best one can be an overwhelming process. Some treats are protein-rich, others are grain-free and some are just pure indulgence. Obviously, you want a treat that your cat will not only enjoy eating, but that will at least somewhat complement her diet. So which treat checks all the boxes? To answer that question, you need to take your own and your cat’s needs into account. Maybe your four-legged friend is a senior cat? Or he prefers wet treats over dry, crunchy ones? Do you want supremely healthy treats or you’re ok with not that healthy but absolutely delicious treats? To help you answer those and many other questions, we’ve put together this simple but useful buying guide. Hopefully, it will help you make an informed decision that your cat will love. Standard dry treats: most cats go crazy for regular crunchy treats, as they’re not only delicious but fun to chew. Some are protein-rich, others are low-fat, and some are grain-free. The options are many, and you’re sure to find at least one treat your tabby will love. Standard wet treats: similar to dry treats, wet treats are adored by most cats. They come in the form of tender meat-like treats, sauces or straight up liquids. If you have a senior cat, liquid treats are the best option as they don’t require crunching and chewing in order to be consumed. Dental treats: these treats are basically two-in-one treats, as they’re not only tasty and most cats love chewing on them, but they’re great for oral health. If your cat has teeth problems, bad breath or is starting to develop gingivitis, definitely give dental treats a try. Special diet treats: treats that cater to specific health problems, such as diabetes, kidney issues or allergies are called special diet treats. You may want to buy only these if your cat has serious health issues. For instance, treats low in protein are the way to go if your pet has kidney disease, while treats with no sugar and grain are good for cats with diabetes. There are so many cat treats our there, it’s hard to count them all. But not all treats are actually good for your feline pet – no matter how delicious your cat may find them, some treats are just sugar, salt, wheat and corn fillers. Obviously, you want to avoid those as much as possible and stick to healthier treats. But what are the healthier alternatives? It’s affordable (fits your budget). It’s not that hard, right? You’d be surprised at how difficult it is to find treats that tick all the right boxes. Most that are very tasty are poor in nutrition, and those that are really healthy are not cats’ favorites. And treats that are both healthy and delicious? More often than not, they’re super-expensive. Still, there are quite a few treats that are good all around, and most of them can be found right here, on our top 10 list. Now that you know what to look for in cat treats, it’s time we cover the things that should be avoided. First, let’s talk about what cats in the wild eat – meat, some more meat and then a bit more meat. Occasionally, bits of grass find their way into wild cats’ stomachs, either because they purposefully eat bits of specific types of grass, or because they were in their prey’s stomach. What about house cats- should they have different diets? Not really, as most indoor cats have the same dietary needs as their wild cousins, but some tabbies may thrive better with a bit more fiber in their diet, or more healthy oils (omega 3 fatty acids, found in fish oil) than usual. Some experts advise even against artificial preservatives, such as BHA and BHT, but not all cats react badly to these (in fact, FDA has labeled these preservatives as Generally Recognized as Safe). Finally, if your kitty is on the heavy side and you need to make sure she’s not gaining any more weight, skip wheat, corn and soy as well. These are ok in small amounts for most healthy cats, but should be avoided if your cat has health issues such as diabetes, or is overweight. Q: Why Give Your Cat Treats? A: If your cat has a top-notch diet and seems generally happy, you may be wondering why even bother with treats? The answer may surprise you, as there are quite a few reasons to give your feline pet treats from time to time. ‘Dogs can be trained, but cats cannot’. How many times have you heard this? Sure, cats can’t do as many tricks as dogs, but they most definitely can be trained to behave nicely and properly. And the best way to do that? Positive reinforcement. For example, if you want to train your cat to come running when you call him, give him a treat every time he actually does it. Want to train your kitty to stop meowing every time you eat lunch? After you tell her to stop and she listens, give her a treat. Likewise, when your pet is not listening, don’t reward her with a treat. Like humans, cats also need to take care of their oral health. Obviously, they cannot brush their teeth by themselves, but at least they can eat foods that help them fight oral health problems. Offering dental cat treats is a great way to make your pet happy and healthy, as these combat tartar buildup and plaque and help prevent gingivitis. If your cat is eating pretty much the same food all the time (especially if it’s the same type of cat food such as dry kibble), it’s probably a good idea to include a treat or two here and there. It will make your feline friend’s life more enjoyable, and as a result, she’ll be happier. Q: How Often Should I Give My Cat Treats? A: Think of cat treats as human snacks – you want to eat wholesome, healthy and nutritionally complete meals throughout the day, but a snack in the evening, after a long day of work, with your favorite TV show on? Nobody can say no to that! Cat treats are the same – they shouldn’t be offered more than a few times a day, tops, no matter how much your cat may meow for them. And trust us when we say this – the cat will meow for her treats if she likes them, so be prepared to stay your ground. All in all, moderation is key: no cat in this world actually requires treats, but do they deserve them? They most certainly do. It’s more than fine to pamper your four-legged companion from time to time, especially if you’re trying to modify his behavior, or you want to reward him for being a well-behaved pet. But be careful – treats can be a slippery slope that leads to spoiled rotten pets, so exercise control and practice moderation and you and your feline friend will be good to go.